Hello, I'm Jeanette the Club Steward here at Ravensworth Golf Club. the perfect package for you. 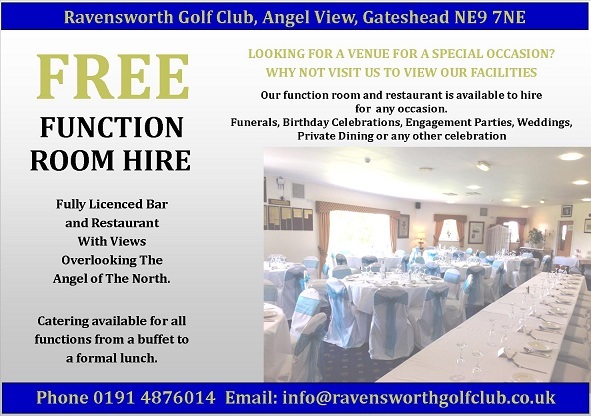 We can host your daytime / evening wedding reception, birthday parties, baby showers, engagements, funerals or any other function and tailor it to meet your needs. We have a fully stocked bar, onsite catering facilities and we can also supply our regular professional DJ with disco and karaoke if required. 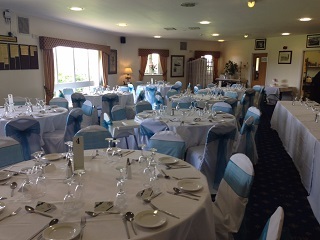 We have a large car park and our function room room can hold 180-200 guests, depending on the room setup you require. We can also divide the room to create a smaller more intimate environment for you. Please feel free to contact myself using our contact details page. Club House whilst discussing your individual requirements in detail. Our wedding evening couldn't have gone any better. The DJ and Balloon Decoration people were recommended by your club which was very helpful. The bar staff were excellent and many guests commented on how lovely the buffet was. Thanks, Wendy & Alan Mayne. © 2012 Ravensworth Golf Club. All rights reserved.